A new $80 million anti-Trump network is being led by an organization whose top funder is liberal billionaire George Soros and which employs former members of the controversial and now-defunct Association of Community Organizations for Reform Now (ACORN). The Center for Popular Democracy Action Fund, the 501(c)(4) sister organization of the Center for Popular Democracy (CPD), a New York-based nonprofit that receives the bulk of its funding from George Soros, announced at their spring gala Tuesday that they will be heading up the new $80 million anti-Trump network that will span 32 states and have 48 local partners, CNN reported. The network will seek to mobilize new voters and fight voter identification laws. It will also focus on gerrymandering and automatic voter registration programs with an eye on the 2018 and 2020 election cycles. Rep. Keith Ellison (D., Minn.), the deputy chair of the Democratic National Committee, backed the new effort. 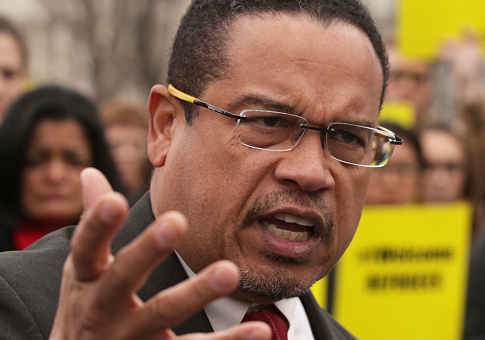 "This national network, led by working class people of color and immigrants, will supply the power and the fight we need to resist the Trump administration's all-out assault on American values," Ellison told CNN. "I look forward to standing with CPD Action's leaders in the streets and in Congress to win real progressive change." The Center for Popular Democracy, which was founded in 2012, consists of old chapters of ACORN, the community-organizing group that was forced to close after being stripped of its federal funds following controversy in 2010. Andrew Friedman, a co-executive director at the Center for Popular Democracy, co-founded Make the Road New York, a Latino immigrant group that has worked alongside CPD on a number of anti-Trump campaigns. Friedman serves on the board of Make the Road New York (MRNY) and Make the Road Action Fund, which are closely linked to CPD and contain many overlapping staffers. Others in leadership roles at CPD have come directly from ACORN. Brian Kettenring, the other co-executive director of the CPD, was an organizer for ACORN from 1995 to 2010. Steve Kest, a senior advisor at CPD, worked for ACORN for 35 years and served as its national executive director. Christina Livingston, a board member of CPD, is the executive director of the Alliance for Californians for Community Empowerment. Livingston previously organized for ACORN out of Los Angeles. Steve Dooley, the director of partnerships at CPD, began his career at ACORN in D.C. Dooley later directed ACORN's offices in the Dallas/Fort Worth area. Greg Basta, the director of sustainability initiatives at CPD, worked as the statewide canvass director for the New York ACORN for five years. Basta was a founding staff member of New York Communities for Change (NYCC), an ACORN offshoot that was founded in 2010. The groups, which have combined to receive millions in funding from George Soros, funnel money to each other. From 2012 to 2014, New York Communities for Change provided $81,700 to the Center for Popular Democracy, according to the group's Form 990s up to 2014, the last available year. NYCC also passed $358,533 to the Make the Road New York Action Fund during this time. The Center for Popular Democracy gave New York Communities for Change $406,667 between 2012 and 2014. CPD additionally gave Make the Road New York $173,955. CPD's Action Fund added another $100,000 to New York Communities for Change. The Center for Popular Democracy did not respond to inquiries on the new $80 million anti-Trump network. New York Communities for Change and Make the Road New York also did not return requests for comment. CPD and MRNY have been extremely active in the anti-Trump arena, using protests and pressure campaigns. The two groups recently "partnered" on a "Corporate Backers of Hate" campaign that targeted JPMorgan Chase, Wells Fargo, Goldman Sachs, Boeing, Disney, IMB, Uber, Blackrock, and Blackstone, corporations they say could profit from President Trump's policies. The "mass lobbying" campaign consists of directly pressuring higher ups at each company through emails and has been called "unprecedented" by corporate responsibility experts. Make the Road was also reported to have organized the "spontaneous" protests at New York's JFK Airport following Trump's Muslim travel ban. However, it was later discovered that the protests had been planned since the day after the presidential election. Uber, which had continued to pick up passengers from the airport during the event, found themselves in the center of the #DeleteUber pressure campaign following the protests. The CEO of Uber, Travis Kalanick, later stepped down from Trump's advisory council. The group is also behind the #GrabYourWallet campaign, which targets retailers for carrying Trump family products. Nordstrom ultimately pulled Ivanka Trump's products, although the store had claimed they had dropped her brand due to declining sales. The Center for Popular Democracy's new multi-million dollar network falls in line with a number of major liberal groups who have reorganized to fight back against voter laws following Donald Trump's victory. Demos, a New York City-based progressive public policy group chaired by Sen. Elizabeth Warren's (D., Mass.) daughter, has been assisting unions in pushing back against election lawsuits in number of states after counties had failed to properly maintain their voter rolls. Demos received hundreds of thousands in funding from Soros' groups. Marc Elias, Hillary Clinton's former top campaign lawyer, recently joined the board of Priorities USA Action, a major Democratic super PAC that received $9.5 million from Soros during the 2016 election cycle. Elias was tapped as the group shifts its focus on pushing back against state-level Republican efforts on voting laws. Every Citizen Counts, a nonprofit founded by Clinton allies focused on mobilizing African American and Latino voters, was absorbed into Priorities USA. Elias will spearhead challenges against state voting laws from the organization's nonprofit arm, which is building a national database to be a "one-stop inventory of restrictive voting measures" that they will share with other progressive groups. Elias previously engaged in a multi-state effort to overturn voter ID laws leading up to the 2016 presidential election. The challenges were backed by millions of dollars from Soros. Soros has a goal of enlarging the electorate by 10 million voters by 2018, the Washington Free Beacon discovered after a trove of hacked Soros documents were released last year by DC Leaks. The plan to grow the electorate by millions of voters and combating "suppression" was listed as a top priority in a 220-page guide from his Open Society Foundations. "The Open Society Foundations supports efforts to encourage wider participation in U.S. elections, and opposes measures used to try to suppress voter participation," a spokesman from the Open Society Foundations told the Free Beacon at the time. This entry was posted in Issues and tagged George Soros. Bookmark the permalink.